MACON, Ill. – Tanner Thorson is making the most of his opportunities. After Keith Kunz Motorsports went idle this week, Thorson jumped into equipment owned by Don Fike of Galesburg, and the 18-year-old quickly moved to the front of the pack. He finished second at the POWRi Speed Week opener at Quincy Raceways Thursday before winning the POWRi feature at Lincoln Speedway Friday. “If you’re a real racer, you jump into any car and adapt,’’ Thorson said earlier in the day, then backed it up later that night. The victory was his second of the season and his POWRi career. The Minden, Nev., native is the driver to beat when the POWRi Lucas Oil National Midget Series heads to Macon Speedway Saturday. Thorson started seventh at Lincoln but rode the cushion to jump into the lead early, and he wasn’t challenged until late in the 30-lap race on the quarter-mile semi-banked track at the Logan County Fairgrounds. Rookie sensation Parker Price-Miller finished second after closing on Thorson, thanks in part to some late yellow flags, but he couldn’t find a way to get into the lead and steal his first POWRi midget victory. Andrew Felker was third, followed by Jake Blackhurst and Darren Hagen, who won the Quincy feature. In the POWRi outlaw micro feature, Aaron Andruskevitch of Riverton scored the victory in the feature event, followed by defending series champ Nathan Benson and Joe B. Miller. In racing action Saturday during IHOIP Night, the POWRi midgets are joined byt the outlaw micros and Beach House mini-sprints. Billingsley Towing modifieds, street stocks, outlaw hornets and stock hornets also race. The B.G. Nevitt Memorial Faster Pastor Race also features five ministers from area churches. Pits open at 3 p.m. Grandstands open at 5 with racing at 7. 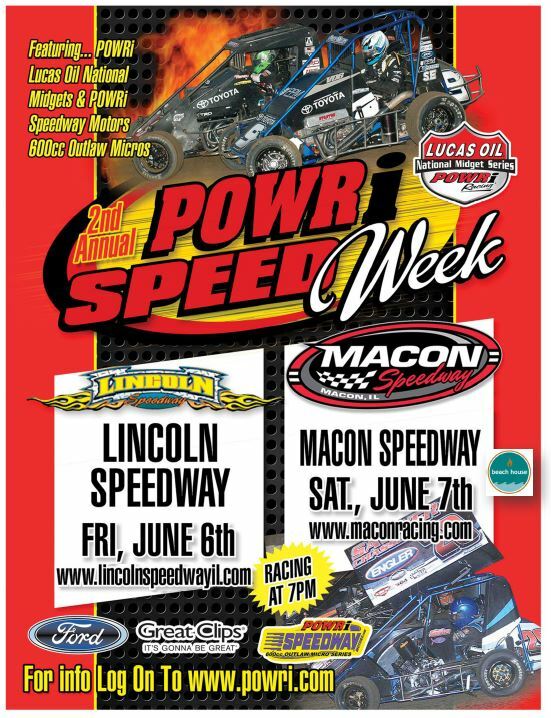 For more information, follow Macon Speedway at (www.maconracing.com), Facebook/maconracing) and Twitter (@maconspeedway). It’s easy to join the Macon Speedway text service. Fans can text MSFANS to 74574 to receive fan information. Drivers can text MSDRIVERS to 74574 to receive driver information. Message and data rates may apply. Updates are also available by calling Macon Speedway at 217-764-3000. Macon Speedway is located nine miles south of Decatur on U.S. 51, then 0.6 miles west on Andrews Street and south to 205 N. Wiles. Macon Speedway hosts racing every Saturday night, plus many weeknight specials.